Kate has an incredible passion for food and innovative cuisine which is evident throughout every course. 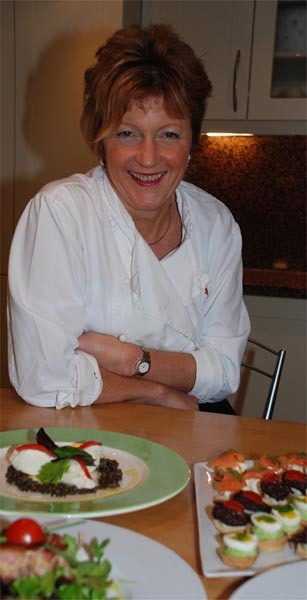 She educates and enthuses with anecdotes of worldwide catering, experiences of fine dining and never fails to impress with her unending culinary creativity. L'Amuse Chez Kate is one of South Wales' finest cookery schools based on the beautiful Gower Peninsula. You will enjoy breathtaking uninterrupted views across Three Cliffs Bay as you enhance your expertise in the kitchen, taking in the wealth of knowledge offered by chef Kate Probert. Having been owner/chef of one of Swansea's finest restaurants for seven years, Kate has developed a reputation for perfect preparation, precise presentation and consistent delivery of quality cuisine. 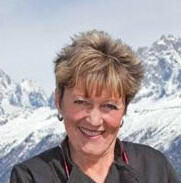 Kate also worked as head chef in one of Gower's finest hotel restaurants (Fairyhill Country House) which won numerous accolades under her supervision from the start in 1983 until 1989. Kate opened her own restaurant, "L'Amuse" in 1995 which she ran for 7 years - creating one of Swansea's finest tables. Kate has also done extensive work in France: Chamonix, Aix-les-Bains and St Gervais and gained experience with Albert Roux at Le Gavroche and Marco Pierre-White at Harvey's. Kate now wishes to share her passion for gastronomy with others.